This time last year I visited the Independent Label Market which included lots of great breweries like Five Points, Beavertown and at the time a not very well known Fourpure. At that time I sampled their Pale Ale and IPA, which I reviewed back at the start of 2014 here. Since then Fourpure have moved on to become one of the biggest breweries in the UK. They now have a core range of six beers including one of my favourite beers of 2014, the Oatmeal Stout. Alongside breweries like Beavertown and Brewdog, Fourpure have upped their can game, making all six of their beers available in can format. This Session IPA by Fourpure is massively inspired by the American craft beer scene of the past 20 years.The Session IPA has a lovely orange glow to it, it has a very strong hoppy aroma including fruits like mango and grapefruit. A session IPA is like an IPA but lower ABV, so like a summer IPA, kinda. I still don’t really get this Session IPA thing, however this one by Fourpure is probably my favourite thus far. Beavertown have a pretty great Session IPA but this Fourpure session IPA. Fourpure constantly put out really great craft beer and the Session IPA is another example of that. I’d only previously tried the IPA, but thanks to Beer52 who do a fantastic monthly beer subscription service I got to try this beer. 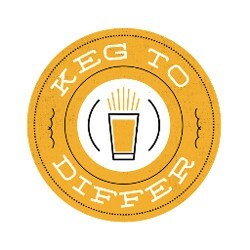 Do go sign up if you love craft beer and use KEGTODIFFER10 to get a £10 discount on your first monthly subscription.